More interesting topic from the book Philosopher at the end of the universe. We now have Tom Cruise who is an actor I like. His good movies include Mission impossible, Jerry McGuire, Last Samurai and many others. Mark Rowlands picked out Minority Report, which is a sci-fi movie on a strange theme. 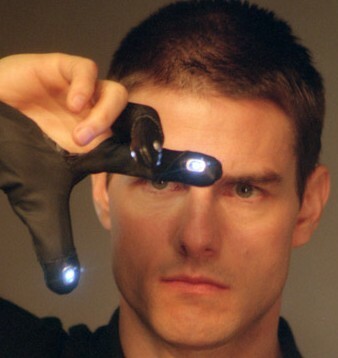 In Minority Report, Tom Cruise was John Anderton, the head of Pre-Crime unit. The unit acted on the vision of precog children who had the ability to see murder scenes occurring in the future. Pre-Crime unit acted a step ahead of time and apprehended the murderers before they murdered and put them in lifelong suspended animation. Tom was set up and led to kill Leo Crow who was disguised as the man who kidnapped and killed Tom's child. The precogs saw the murder and the Pre-Crime unit chased after Tom. Of course the story had a happy ending and Tom escaped his fate of suspended animation, cleared his name, and lived happily ever after. The theme of the movie is on determinism, that everything happens for a cause: a total cause which leads to the happening. The logic has two claims: first, a claim about causation, and the second a consequence. Everything that exists or occurs, including human actions, choices and decision, has a cause. Therefore, human actions, choices and decisions are not free, the reason being the causation has an outcome which is inevitable. A total cause is perceived to include everything that leads to the happening of an event or an action, therefore all the choices and decisions made by a human are just illusions as the event or action is determined to happen as the effect of the total cause. The sad conclusion for human dignity is that we do not have any free will. Pierre-Simon Laplace (拉普拉斯 1749-1827), a French physicist and mathematician but not a philosopher, was an advocate of determinism. He viewed the universe as a gigantic mechanism made up of many interacting parts in complex but predictable way. He noticed that the theory was incompatible with god's action which presumably would be free. According to Laplace, a hypothetical super-being like god would be able to know the exact development of the universe. As long as he knew the initial state of the universe, it would be possible to know everything that was going to happen and the exact time it was going to happen. The hypothetical super-being became known as Laplace's demon. The precogs of Minority Report are in a way a sort of Laplace's demon who could know murders. The opposite of determinism is of course indeterminism. There have been arguments against determinism, in desperate effort to save human dignity that we are actually free. It attacks the basic assumption of a cause for everything, and draws a distinction between cause and influence. Indeterminism argues that our actions may be influenced by preceding events, but they are not caused by those preceding events, and so are not made inevitable. Human choices and decisions may be influenced by all sorts of things, but this does not mean that they are made inevitable by them. So human does have free will. Indeterminism fails when influence is more clearly defined as a partial cause but not the total cause. Some indeterminists try to distinguish influence from any sort of cause, and claims that some actions are free because they are not caused. However, this creates a new problem of a gap in the causal order, that there is a hole in the labyrinth of causal lineages that made up the history of the universe. Both determinism and indeterminism consider that causation is incompatible with freedom. They assume that if choices and decisions are caused, then they cannot be free. David Hume (休謨 1711-1776) has another view. He said that the freedom of choice and decision is compatible with its being caused, as long as it is caused in the right sort of way. This is known as compatibilism. In defining the right sort of way of free choice and decision, compatibilists draw a distinction between internal and external causation. Actions that are caused internally by one's own desire and want are free, while those caused by external factors are not. The problem with compatibilism is that thing which has purely external causes is not an action at all, it is just something happens to you. All actions are the result of a combination of internal and external factors. Also, the most immediate cause of anything is always an internal one. Therefore there is no distinction between free and unfree actions on the basis of the distinction between internal and external causations. There is also an attempt to save human dignity of a free will by the agent causation theory. The view starts from the assumption that an action, choice or decision is free when we have control over it, or we ourselves make the choice or decision. An action is free when it is caused by oneself or the agent, instead of just an internal state. The major problem with the agent causation theory is the definition of the agent, or self. There is problem in defining self as a substantial entity through time, nor it can be defined as a non-physical being. The self may just be a bunch of memories and psychological states, which may not have control over actions, choices and decision; all of them may well be the inevitable effects of the total causation. Minority Report brought out a big question: the problem of freedom of the will. If the precogs could actually see murder happening in the future, then the murderer was not free to make his decision to murder. The murder would happen. This is the basis of determinism and the would-be murderers were put in lifelong suspended animation beyond any doubt. But as the Pre-Crime unit stopped the murder before it happened, then what the precogs saw was not what actually happened in the future. The problem of freedom of the will came to a climax when Tom was about to shoot Leo Crow. But the precog Agatha said to Tom that he had a choice. As it turned out, Leo Crow was shot. Or no matter how Tom made his choice, he shot Leo Crow. He was actually not free. i prefer David Hume says, more practical and optimistic (or it will become very desperate! ), and it closes to Buddhist thought-牽一髮動全身. David's theory may be also fit in another film,Sliding Doors(緣份兩面睇), causation has both hard and soft side.